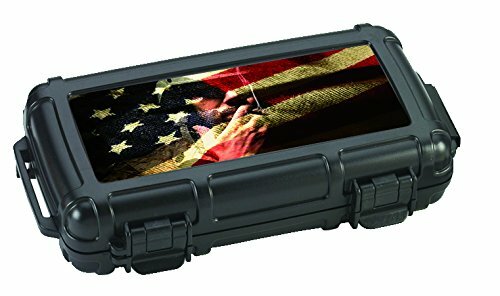 New "Ameri-Caddy" USA design for cigar smoking patriots. Protect your cigars and show your American pride! Same size and construction as the Cigar Caddy 3400 5-cigar caddy. 5 Cigar - Waterproof Travel Humidor with Sleek Black Matte Finish. The ideal travel humidor made for people on the go, or avid outdoorsmen who want ultimate protection for their cigars during their commute, while exposing them to the various elements of nature. Made from Super Strong ABS Molded Plastic. Floats on water. Airtight seal. Waterproof to 100 feet deep. Crush proof. Case can withstand temperature range -10 to 175 Fahrenheit. 2 Removable/Replaceable Locking Clasps Stainless Steel Latch Hinges Molded Lock Ring for Added Security. Coin Release for Air Pressure. 1 Humidifier Disc in Lid. Custom Urethane Foam Protects Cigars. Lanyard with clip for easy transportation. If you have any questions about this product by Cigar Caddy, contact us by completing and submitting the form below. If you are looking for a specif part number, please include it with your message.